I think Author Patrick Rothfuss said it best with the quote on the back of the hardcover edition, "Completely fricking awesome. This book pleased every geeky bone in my geeky body. I felt like to was written just for me." I loved this book. I knew very early that my affection would be deep and sincere. It all started on page 26, the last page of chapter one. The main character, one Wade Watts, a.k.a. Parcival, is asked to recite his login pass phrase to enter the digital world of the Oasis, to which he recites "You have been recruited by the Star League to defend the Frontier against Xur and the Ko-Dan Armada." That's right. Wade just recited a line from The Last Starfighter. One of my favorite 80s space movies. I was in heaven. My affections grew with discussions on John Hughes movies, a character choosing the name Kira after watching The Dark Crystal, and a planet in the Oasis where you complete a Goondock adventure. And to top it all off, there was this emotional, fast paced, thrill ride of a story. The story has elements of dystopia drenched in science fiction, but at the very core, it's filled with heartfelt human moments. Wade is lonely, and he finds acceptance and purpose in an environment outside of the real world. And who can blame him. He's an orphan living in a world of depleted resources and terrible violence. This genius of a man, Jim Halliday, computer programmer billionaire, creates a treasure hunt unlike anything the world has ever seen in the virtual world he created. It is during this hunt that Wade finds friendship, loyalty, love, sacrifice, and courage. And within all of this are some seriously spectacular 80s references. If like feeling nostalgic, enjoy a good treasure hunt, or like rooting for the underdog, (or enjoyed the movie Fanboys!!) 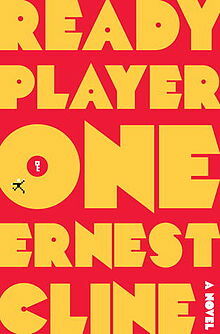 check out Ernest Cline's Ready Player One.